I have only recently taken card making up again after a long spell of being ill. I am just making any kind of cards that I can, to get me back into the 'swing' of things again. I have forgotten so much, but hopefully this will be the start of better things to come. 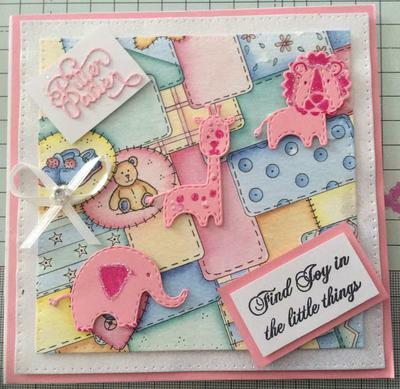 My first card is Baby Card which has dies by Sue Wilson - New Arrival - Stuffed Animals. I have used the Elephant, Giraffe, Lion and Pitter Patter. The other stamp, I cannot remember where I got this one from, but I liked it to put onto the card. The card is a 6 x 6 and I have used pink, white glitter and a multi coloured paper. 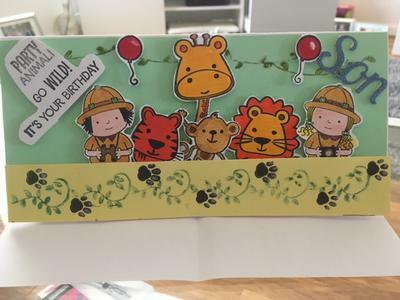 I coloured in parts of the die cut animals to make them stand out a bit more. Hi Jennifer how good to see you back again and I don't think it will take you long to get back into the swing of things. A very quick card, DL size, dark purple and light purple card, with ribbon put round the bottom of the card and 4 pearls at the corners. The die that I used was a Die-Versions alphabet die, 'A Hint of Lime' font. I used the letters to spell out Happy Birthday on the bunting. I put a small purple butterfly on the right hand corner of the card. 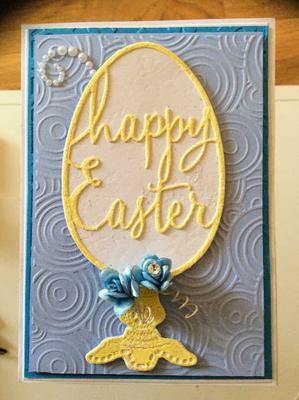 Another lovely card and this is so simple and elegant and I love the colours you have used. I am in the process of making a variety of different cards, so this is another Happy Birthday one that I have finished. This is a 7 x 7 card. Dies used: Chrysanthemum by Sue Wilson, Happy Birthday die was a free gift from one of my magazines. I also used the Dotty Clouds embossing folder, which is really nice as it is not heavily embossed. 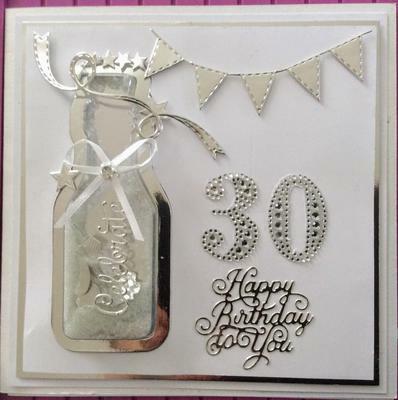 I used Silver Mirri card first, then the layer with the Dotty Clouds embossing, I then cut out 3 smaller squares in Silver and White and mounted the Happy Birthday die onto the last piece of card. I die cut the Chrysanthemum die and used two of the sizes available to create the flower, Imade the centres of the flowers with silver and yellow. In order to make the most of these flowers, I would really have to make a box to put the card in as when it goes into an envelope it 'squashes' the petals, which is a shame as it is really pretty. I also put pearls at each of the corners of the card. I think these were the very first cards I made on my journey back to card making. The cards were all 10.5 x 15cm and I layered them first with a coloured piece of card and then used various dies on the front. 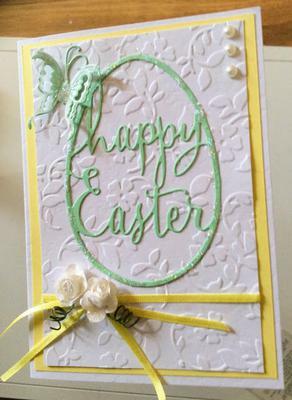 I may mention some dies which do not show on the cards, but I had made quite a few Easter cards. Dies used: Springtime Floral Egg - Memory Box, Happy Easter Egg - Memory Box, I used both the Anya and Catarina Faberge Eggs with the Decorative Stand. I didn't really use a lot of embellishment on these cards, only a couple of flowers a piece of ribbon, some glitter and really not much more. I hope that you like these little cards. This is the first time I have ever made a Sympathy card, and I don't think it is one that anyone would ever get used to making. I was asked to make a few of these as the lady said to me, 'I never know when I will need one, so I better have a few just in case', each to their own I suppose, but it is not cards I would like to have a few of. 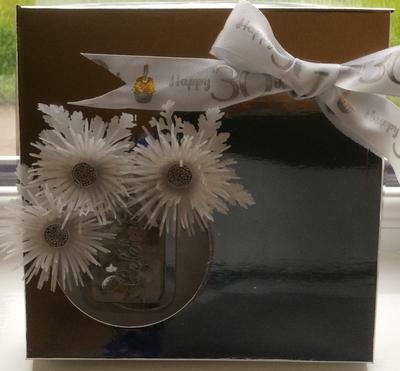 I started off by using a 7 x 7 white card and then layered it with black and cream card, I tied a white ribbon round the bottom of the card and used the Pierced Rectangles (6th & 7th smallest dies) to produce the frames in cream and black. I used the insert from the 5th die to die cut a black cut out to which I attached the flower, cut in cream and green. 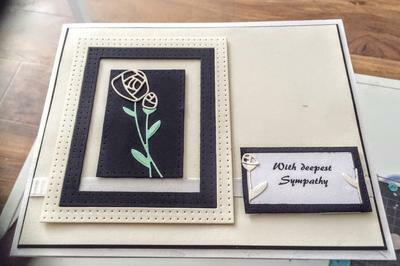 The verse inside the card reads: 'Although no words can really help to ease the loss you bear, just know that you are very close in every thought and prayer'. 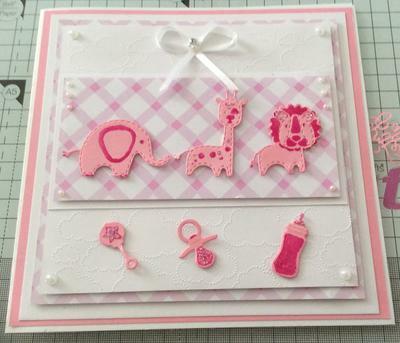 The first card, I layered with pink, white and a pink and white chequered card. I then used the New Arrival - Stuffed Animals dies from Sue Wilson, I used a Pink Glitter pen to colour in the little bits on each of the animals. I attached them to the pink & white chequered card, I then attached 3 pearls to each side. I then used the Signature Collection by Sara Davies, Little Angel, Baby Accessories. I used the Rattle, Dummy and Baby Bottle and again used the Pink Glitter pen to colour in some little bits on each of them. I finished off the card with a little white ribbon and another couple of pearls. 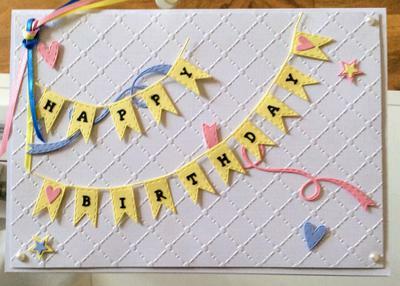 The next card I layered with yellow card and yellow chequered card, I used a stitched border for the pink card. 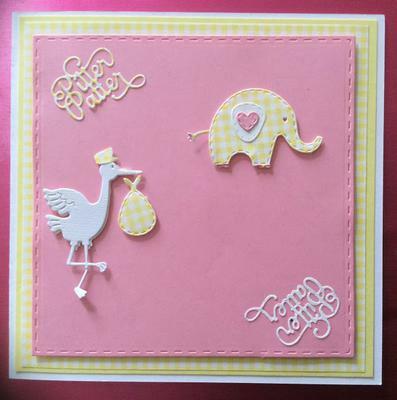 The dies that were used were New Arrival - Stork and Baby by Sue Wilson. I hope you like both of these cards, but comments are always welcome. This was a card I made for my Mum's friend of 50 years, she had a 'stint' in hospital, thankfully she is back home again where she should be and feeling much better. 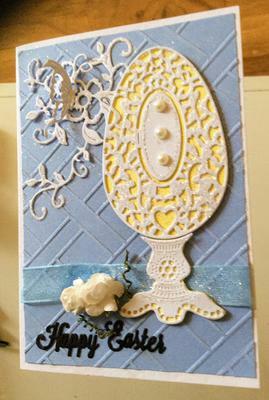 Anyway, this was a 7 x 7 white card, which I then layered with a piece of white card, embossed with Clouds. 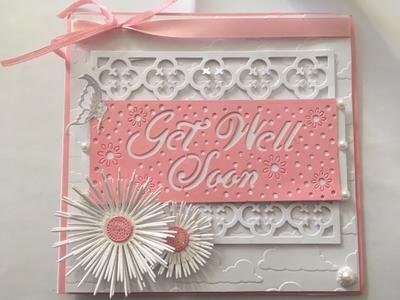 I used the Get Well Soon die from Die'sire - Crafters Companion. I then attached a little butterfly on the left hand side of the card, 3 pearls on each side. 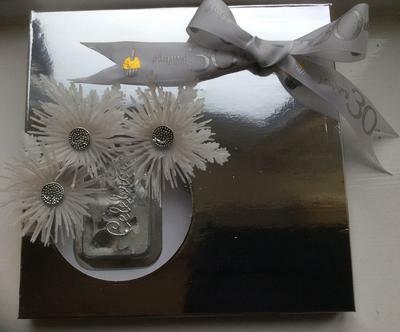 I also used the Chrysanthemum die from Sue Wilson, which is an absolutely beautiful die, however, if you want to 'fix' the petals properly you will have to use a box to put your card in, because as soon as you put it into the envelope the petals are 'squashed'. This card was created with using the Banner Parade - Memory Box Dies. I then cut out the 'flag bunting' and cut out an alphabet using a Die-Versions - Alphabet die - A Hint of Lime font. I then attached the alphabet by carefully using my tweezers and glue. Once the letters were attached and dried, I then attached a blue and pink swirl with a couple of hearts and stars. To finish it off I tied 3 pieces of pink, blue and yellow ribbon together. This was a Birthday card that I made for my son who was 28 on the 19th April, I had a few voucher gifts to give him and I had already bought a Birthday card for him, but decided to give this one a go. Colouring in is definitely not my strong point, I have a long way to go with this, but, for this card I think it looked ok. I got the stamps as a free gift from one of my many magazines that I buy, I stamped the images and coloured them in and then fussy cut them out and placed them onto the card. Apologies, I had forgotten about the box. I used the Top Score multiboard by Crafters Companion to create my box. I used Creative Expressions Craft Dies by Sue Wilson - Finishing Touches - Chrysanthemum. I die cut them from Vellum, I put some Glossy Accents over the petals and then I attached a bow to reflect her age. 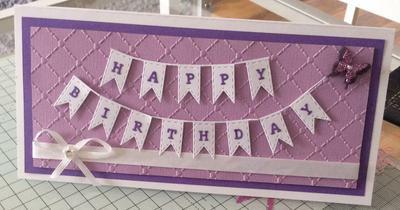 These cards were made using the same Happy Birthday die, which I got from one of my magazines. It is a really useful die, as you can use it as a complete die or cut it up and use the other parts in different parts of the card. Both of these cards show that. I hope that I have got them the right way round when explaining them. The first card, I die cut the side of the card with a ribbon die (one of the many that I have), once I had done this I put another piece of pink card inside the white card, (prior to securing the pink to white, I attached a piece of pink ribbon) so that the inside was pink. 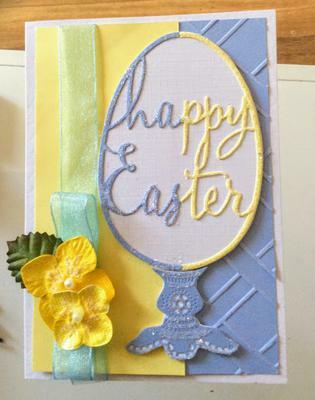 I then cut out 3 separate pieces of card in pink, yellow and white and layered them up. 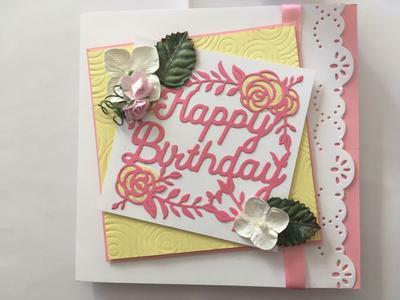 I die cut the Happy Birthday in pink and put yellow behind the roses on the die cut. I then attached a couple of roses and leafs and a couple of other flowers. I only used a small amount of glitter on the card. 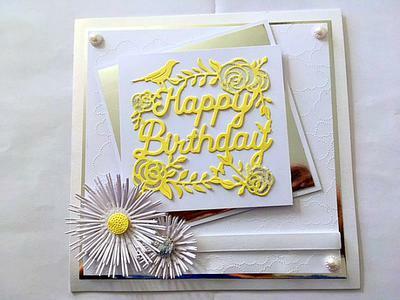 The other card, I die cut a circle in the centre of the card then I embossed the card. 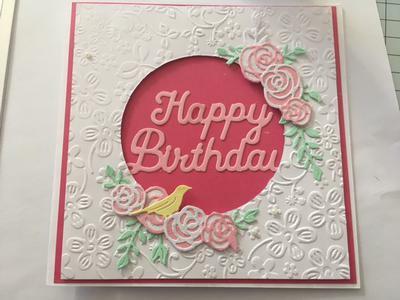 I then used a piece of dark pink and used part of the die, Happy Birthday and glued it onto the pink card. Once this was done, I put the embossed piece of card over the top of the Happy Birthday and secured it with sticky fixers. To finish off the card, I used the other parts of the die that I had cut off, the Roses, leafs and little bird. It just shows how we can use dies in different ways and that we don't have to use them exactly as they are given to us.